After 18 years of experience some of our customer show their appreciation as follow. I am pleased to take this opportunity to express our distinct pleasure of working directly with Diego Lenis of Yahan Inc and his staff. Our experience has always been exceptional, from the beginning of an initial quote from their office to any outside carrier and final completion and installation. We are most appreciative of their full attention and consideration even after installation which Yahan Inc has always demonstrated and assured us of the quality of their work. You can just stroll down any of our shopping centers and appreciate the wonderful workmanship at our centers. Thank you to all for your hard work and efforts. I want to let you and your employees know how pleased we are with the canopy that Yahan recently installed our toll plaza. The fabrication and installation exceeded our expectations the work was completed in a timely manner and the product was professionally fabricated and installed. We have received many compliments from our toll booth patrons, concerning our bright, new canopy. Mani travelers stop in front of our toll plaza and take photos of the messages your workers installed, “Welcome to Monroe County and the Fabulous Florida Key” as they enter Monroe County, and “Come again – Don’t forget your Keys” as they leave. Please encourage any potential customers to contact me regarding this installation, I would be happy to discus our experience with them. I would like to comment on the awning you recently made that cover the bottom deck of my patio, adjoining the water. I have already had a couple of occasions to use the area under the awning for entertaining. I was quite pleased when my guest and family complimented it’s great look. Thank you for designing the awning and picking out such a nice fabric. I look forward to having you do another project at my home. I wanted to take the time to write you this letter. We had a retractable awning installed a few years ago and our motor stopped working, I've been trying for months to get a hold of the company who originally installed it and is no where to be found. I did some researching and found your company and since the day you came out to our house you were so nice and explained everything to me and my husband. It has been a nightmare and I just wanted to compliment you, your workers and company. The product sells itself. We didn't have to replaced the awning but because we had exceptional service we are planning on having the awning redone. The installation crew was very good, fast, and polite. I was very impressed with all of your people and just wanted you to know that I am referring you to my friends and neighbor who will soon be buying a retractable awning. Keep up the good work. It really was a very good experience working with you and your company. We can now sit under our awning. We have not been able to use our awning for sometime now, but the summer sun made it almost unbearable to enjoy. Now with our new retractable awning motor that was replaced we will start using our patio more often and have more cook outs. Also, we appreciate your knowledgeable installers and the quick turn around time. 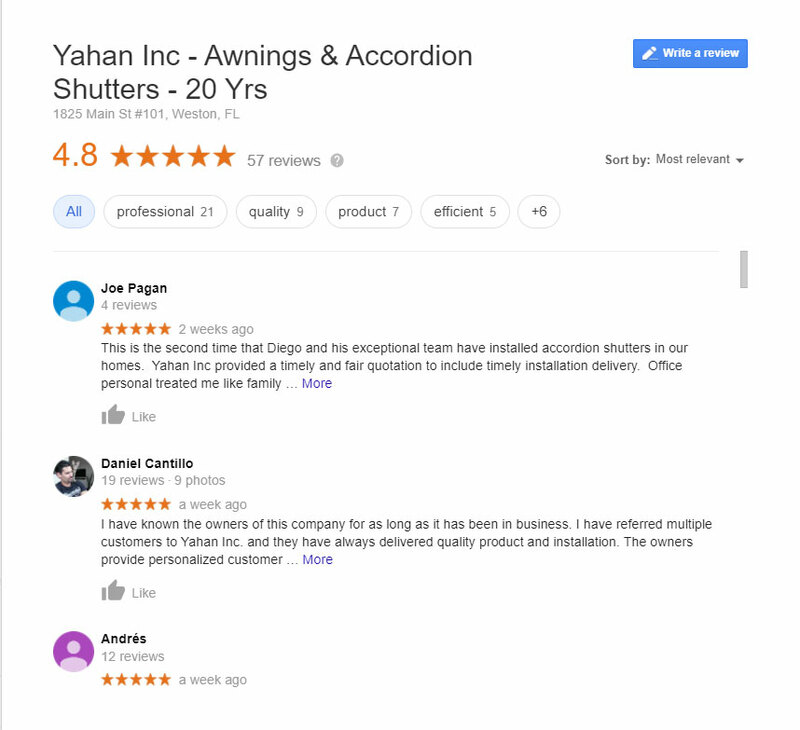 We are very pleased with the final results and will not hesitate to recommend YAHAN COMPANY to family, friends, neighbors and co-workers. My wife contracted with Diego Lenis of Yahan Inc. for the installation of a re fabrication of Sunbrella awnings. He not only gave her the best price for the job, but succeeded in the manufacturing and installation of the product in 9 days. We found the quality of the workmanship and the installation to be of the highest standards. We never expected the job to be completed in that short a period of time, and could not be happier with the final result. We would like to commend Diego on his outstanding commitment to our job, and would recommend him to anyone looking for similar work. Our sincerest thanks to him and his very professional staff. Sitemap | © Yahan Inc. All rights reserved.